In this post we highlight the doctoral thesis paper of Antti Piirto, “Safe Operation of Nuclear Power Plants – Is Safety Culture an Adequate Management Method?”* One reason for our interest is the author’s significant background in nuclear operations. ** Thus his paper has academic weight but is informed by direct management experience. It would be impossible to credibly summarize all of the material and insights from this paper as it covers a wide swath of safety management and culture and associated research. The pdf is 164 pages. In this post we will provide an overview of the material with pointers to some aspects that seem most interesting to us. The paper is developed from Piirto’s view that “Today there is universal acceptance of the significant impact that management and organisational factors have over the safety significance of complex industrial installations such as nuclear power plants. Many events with significant economic and public impact had causes that have been traced to management deficiencies.” (p. i) It provides a comprehensive and useful overview of the development of safety management and safety culture thinking and methods, noting that all too often efforts to enhance safety are reactive. “Safety management at nuclear power plants needs to become more transparent in order to enable us to ensure that issues are managed correctly.” (p. 6) “Documented safety thinking provides the organisation with a common starting point for future development.” (p. 8) Transparency and the documentation (preservation) of safety thinking resonates with us. When forensic efforts have been made to dissect safety thinking (e.g., see Perin’s book Shouldering Risks) it is apparent how illuminating and educational such information can be. We would say that in terms of a control mechanism, culture’s effect should be clarified as being one of perhaps many mechanisms that ultimately combine to determine actual behavior. In our conceptual model safety culture specifically can be thought of as a resistance to other non-safety pressures affecting people and their actions. (See our post dated June 29, 2012.) Piirto calls culture a “powerful lever” for guiding behavior. (p. 15) The stronger the resident safety culture is the more leverage it has to keep in check other pressures. However it is also almost inevitable that there can be some amount of non-safety pressure that compromises the control leverage of safety culture and perhaps leads to undesired outcomes. Some of Piirto’s most useful insights can be found on p. 14 where he explains that culture at its essence is “a concept rather than a thing” - and a concept created in people’s minds. We like the term “mental model” as well. He goes on to caution that we must remember that culture is not just a set of structural elements or constructs - “It also is a dynamic process – a social construction that is undergoing continual reconstruction.” Perhaps another way of saying this is to realize that culture cannot be understood apart from its application within an organization. We think this is a significant weakness of culture surveys that tend to ask questions in the abstract, e.g., “Is safety a high priority?”, versus exploring precisely how safety priorities are exercised in specific decisions and actions of the organization. Starting on p. 39 is a very useful discussion of Knowledge Management including its inherently dynamic nature. Knowledge Management is seen as being at the heart of decision making and in assessing options for action. In the last sections of the paper Piirto summarizes the results of several research projects involving training and assessment of training effectiveness, knowledge management and organizational learning. Generally these involve the development and training of shift personnel. Ultimately I’m not sure that the paper provides a simple answer to the question posed in its title: Is safety culture an adequate management method? Purists would probably observe that safety culture is not a management method; on the other hand I think it is hard to ignore the reliance being placed by regulatory bodies on safety culture to help assure safety performance. And much of this reliance is grounded in an “espoused theory” of behavior rather than a systematic, structured and documented understanding of actual behaviors and associated safety thinking. Such “theory in use” findings would appear to be critical in connecting expectations for values and beliefs to actual outcomes. Perhaps the best lesson offered in the paper is that there needs to be a much better overall theory of safety management that links cultural, knowledge management and training elements. * A. Piirto, “Safe Operation of Nuclear Power Plants – Is Safety Culture an Adequate Management Method?” thesis for the degree of Doctor of Science in Technology (Tampere, Finland: Tampere Univ. of Technology, 2012). ** Piirto has a total of 36 years in different management and supervision tasks in a nuclear power plant organization, including twelve years as the Manager of Operation for the Olkiluoto nuclear power plant. The words dynamic and interactive always catch our attention as they are intrinsic to our world view of nuclear safety culture learning. Carlo Rusconi’s presentation* at the recent IAEA International Experts’ Meeting on Human and Organizational Factors in Nuclear Safety in the Light of the Accident at the Fukushima Daiichi Nuclear Power Plant in Vienna in May 2013 is the source of our interest. While much of the training described in the presentation appeared to be oriented to the worker level and the identification of workplace type hazards and risks, it clearly has implications for supervisory and management levels as well. This part of the training is described as a “simulation” as it provides the opportunity for students to simulate the performance of an investigation into the causes of an actual event. Students are organized into three groups of five persons to gain the benefit of collective analysis within each group followed by sharing of results across groups. We see this as particularly valuable as it helps build common mental models and facilitates integration across individuals. Last, the training session takes the student’s results and compares them to the outcomes from a panel of experts. Again we see a distinct parallel to our concept of having senior management within the nuclear organization pre-analyze safety issues to establish reference values for safety significance, uncertainty and preferred decisions. This provides the basis to compare trainee outcomes for the same issues and ultimately to foster alignment within the organization. 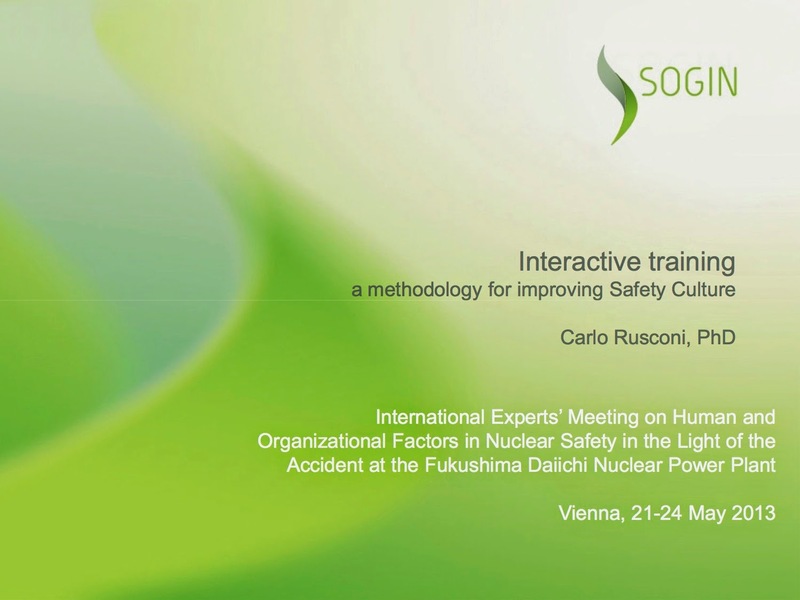 * C. Rusconi, “Interactive training: A methodology for improving Safety Culture,” IAEA International Experts’ Meeting on Human and Organizational Factors in Nuclear Safety in the Light of the Accident at the Fukushima Daiichi Nuclear Power Plant, Vienna May 21-24, 2013. ** See our blog posts dated April 9 and June 6, 2013. We also remind readers of Taleb’s dictate to decision makers to focus on consequences versus probability in our post dated June 18, 2013. 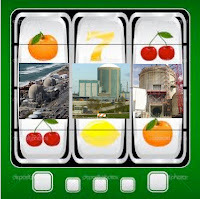 The NRC's assessment of safety culture (SC) is an example of regulatory creep. It began with the requirement that licensees determine whether specific safety-related performance problems or cross-cutting issues were caused, in whole or in part, by SC deficiencies. Then the 2011 SC Policy Statement attempted to put a benign face on NRC intrusiveness because a policy statement is not a regulation. 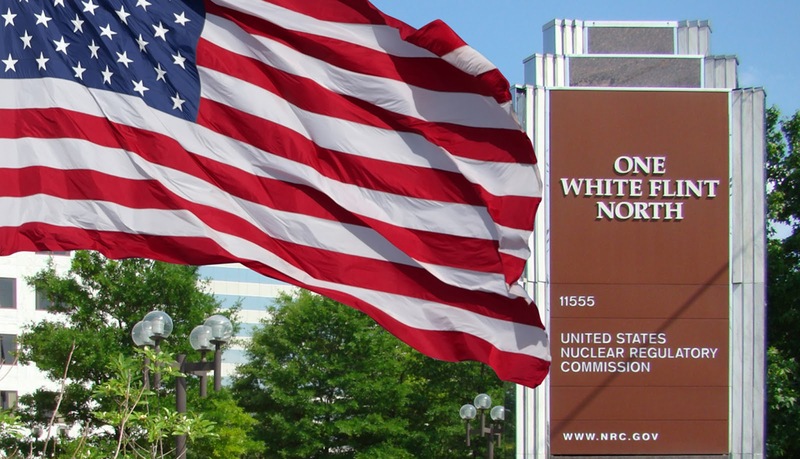 However, licensees are “expected” to comply with the policy statement's goals and guidance; the NRC “expectations” become de facto regulations. We have griped about this many times. * But why does regulatory creep occur? Is it inevitable? We'll start with some background then look at some causes. In the U.S., Congress passes and the President approves major legislative acts. These are top-level policy statements characterized by lofty goals and guiding principles. Establishing the detailed rules (which have the force of law) for implementing these policies falls to government bureaucrats in regulatory agencies. There are upwards of 50 such agencies in the federal government, some part of executive branch departments (headed by a Cabinet level officer), others functioning independently, i.e., reporting to Congress with the President appointing, subject to Congressional approval, their governing boards (commissioners). The NRC is one of the independent federal regulatory agencies. Regulatory rules are proposed and approved following a specified, public process. But once they are in place, multiple forces can lead to the promulgation of new rules or an expanded interpretation or application of existing rules (creep). The forces for change can arise internal or external to the agency. Internal forces include the perceived need to address new real or imagined issues, a fear of losing control as the regulated entities adapt and evolve, or a generalized drive to expand regulatory authority. Even bureaucrats can have a need for more power or a larger budget. External sources include interest groups (and their lobbyists), members of Congress who serve on oversight committees, highly motivated members of the public or the agency's own commissioners. We classify commissioners as external because they are not really part of an agency; they are political appointees of the President, who has a policy agenda. In addition, a commissioner may owe a debt or allegiance to a Congressional sponsor who promoted the commissioner's appointment. Given all the internal and external forces, it appears that new rules and regulatory creep are inevitable absent the complete capture of the agency by its nominally regulated entities. Creep means a shifting boundary of what is required, what is allowed, what is tolerated and what will be punished—without a formal rule making. The impact of creep on the regulated entities is clear: increased uncertainty and cost. They may not care for increased regulatory intrusiveness but they know the penalty may be high if they fail to comply. When regulated entities perceive creep, they must make a business decision: comply or fight. They often choose to comply simply because if they fight and lose, they risk even more punitive formal regulation and higher costs. If they fight and win, they risk alienating career bureaucrats who will then wait for an opportunity to exact retribution. A classic lose-lose situation. Years ago I took a poli-sci seminar where the professor said public policy forces could be boiled down to: Who's mad? How mad? And who's glad? How glad? I sometimes refer to that simple mental model when I watch the ongoing Kabuki between the regulator, its regulated entities and many, many political actors. Regulatory creep is one of the outcomes of such dynamics. * For related posts, click the "Regulation of Safety Culture" label. Regulatory creep is not confined to the NRC. The motivation for this post was an item forwarded by a reader on reported Consumer Product Safety Commission (CPSC) activity. Commenting on a recent settlement, a CPSC Commissioner “expressed concern that . . . the CPSC had insisted on a comprehensive compliance program absent evidence of widespread noncompliance and that “the compliance program language in [the] settlement is another step toward just such a de facto rule.”” C.G. Thompson, “Mandated Compliance Programs as the New Normal?” American Conference Institute blog. Retrieved June 6, 2013. Posted by Bob Cudlin 5 comments. Click to view/add. 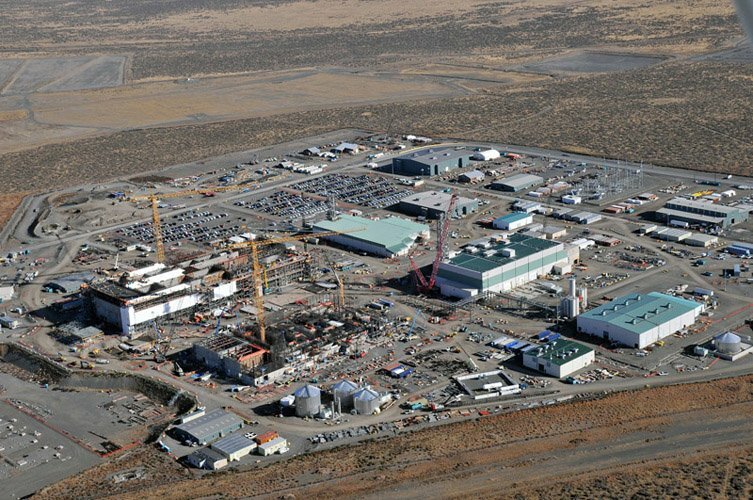 Previous posts* have chronicled the safety culture (SC) issues raised at the Waste Treatment and Immobilization Plant (WTP aka the Vit plant) at the Department of Energy's (DOE's) Hanford site. Both the DOE Office of River Protection (ORP) and the WTP contractor (Bechtel) have been under the gun to strengthen their SC. On May 30, 2013 DOE submitted a progress report** to the Defense Nuclear Facilities Safety Board covering both DOE and Bechtel activities. Based on an assessment by an internal SC Integrated Project Team (IPT), ORP reported its progress on nine near-term SC improvement actions contained in the ORP SC Improvement Plan. For each action, the IPT assessed degree of implementation (full, partial or none) and effectiveness (full, partial, or indeterminate). The following table summarizes the actions and current status. The top-level ORP actions look substantive but digging into the implementation details reveals many familiar tactics for addressing SC problems: lots of training (some yet to be implemented), new or updated processes and procedures, (incomplete) distribution of INPO booklets, and the creation of a new behavioral expectations poster (which is largely ignored). SC elements have been added to senior management and supervisor performance plans. That appears to mean these folks are supposed to periodically discuss SC with their people. There's no indication whether such behavior will be included in performance review or compensation considerations. ORP did attempt to address concerns with the Differing Professional Opinion (DPO) process. DPO and Employee Concerns Program (ECP) training was conducted but some employees reported reservations about both programs. A new issues management system has been well received by employees but needs greater promotion by senior managers to increase employees' willingness to raise issues and ask questions. The revised ECP also needs increased senior management support. The team pointed out that ORP does not have a SC management statement or policy. “ORP has completed surveillances on 19 of the 27 completed actions identifying 7 opportunities for improvement. Because changing an organization's culture takes time, the current oversight efforts are focused on verifying actions have been completed.” (ibid.) In other words, there has been no evaluation of the effectiveness of Bechtel's actions. The ORP program is a traditional approach aimed at incremental organizational performance improvement. There is no or scant mention of what we'd call strategic concerns, e.g., recognizing and addressing schedule/budget/safety goal conflicts; decision making in a complex, dynamic environment with many external pressures; riding herd on Bechtel; or creating a sense of urgency with respect to SC. The most surprising thing to us was how unexpectedly candid the assessment was (for one produced by an employee team) in describing the program's impact to date. For example, as the IPT performed its assessment, it tried to determine if employees were aware of the SC actions or their effects. The results were mixed: some employees see changes but many don't, or they sense a general change but are unaware of specifics, e.g., new or changed procedures. In general, organizational emphasis on SC declined over the year and was not very visible to the average employee. The team's most poignant item was a direct appeal for personal involvement by the ORP manager in the SC program. That tells you everything you need to know about SC's priority at ORP. * Click on Vit Plant under Labels to see previous posts. ** M. Moury (DOE) to P.S. Winokur (DNFSB), DOE completes Action 1-9 of the Department's Implementation Plan for DNFSB Recommendation 2011-1, Safety Culture at the Waste Treatment and Immobilization Plant (May 30, 2013). A status summary memo from ORP's K.W. Smith and the IPT report are attached to the Moury letter. Our thanks to Bill Mullins for bringing these documents to our attention. 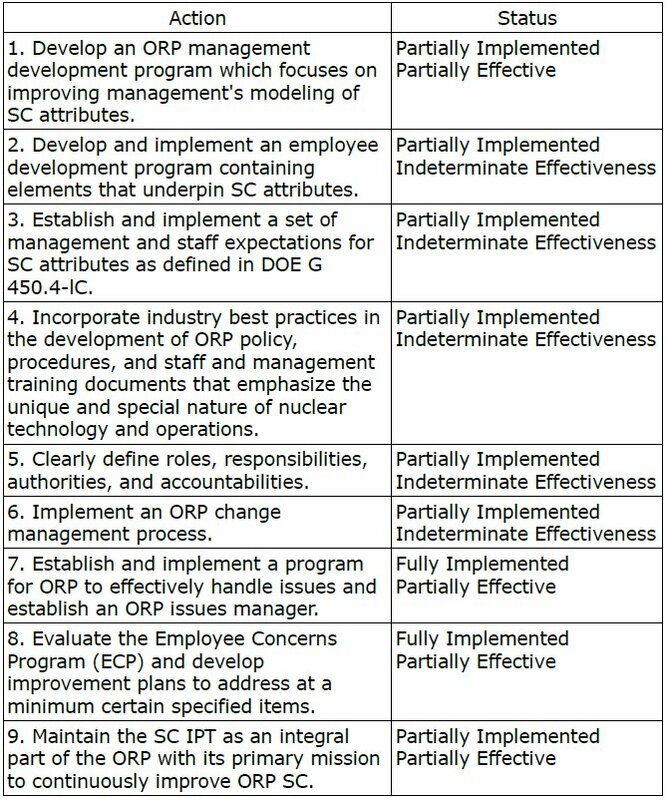 This post continues our discussion of the implementation of safety culture policy in day-to-day nuclear management decision making, started in our post dated April 9, 2013. In that post we introduced several parameters for quantitatively scoring decisions: decision quality, safety significance and significance uncertainty. At this time we want to update the decision quality label, using instead “decision balance”. To illustrate the application of the scoring method we used a set of twenty decisions based on issues taken from actual U.S. nuclear operating experience, typically those that were reported in LERs. As a baseline, we scored each issue for safety significance and uncertainty. Each issue identified 3 to 4 decision options for addressing the problem - and each option was annotated with the potential impacts of the decision on budgets, generation (e.g. potential outage time) and the corrective action program. We scored each decision option for its decision balance (how well the decision option balances safety priority) and then identified the preferred decision option for each issue. This constitutes what we refer to as the “preferred decision set”. A pdf file of one example issue with decision choices and scoring inputs is available here. Our assumption is that the preferred decision set would be established/approved by senior management based on their interpretation of the issues and their expectations for how organizational decisions should reflect safety culture. The set of issues would then be used in a training environment for appropriate personnel. For purposes of this example, we incorporated the preferred decision set into our NuclearSafetySim* simulator to illustrate the possible training experience. The sim provides an overall operational context tracking performance for cost, plant generation and CAP program and incorporating performance goals and policies. In the sim application a trainee would be tasked with assessing an issue every three months over a 60 month operational period. The trainee would do this while attempting to manage performance results to achieve specified goals. For each issue the trainee would review the issue facts, assign values for significance and uncertainty, and select a decision option. Chart 1 compares the actual decisions (those by the trainee) to those in the preferred set for our prototype session. Note that approximately 40% of the time the actual decision matched the preferred decision (orange data points). For the remainder of the issues the trainee’s selected decisions differed. Determining and understanding why the differences occurred is one way to gain insight into how culture manifests in management actions. As we indicated in the April 9 post, each decision is evaluated for its safety significance and uncertainty in accordance with quantified scales. These serve as key inputs to determining the appropriate balance to be achieved in the decision. In prior work in this area, reported in our posts dated July 15, 2011 and October 14, 2011 we solicited readers to score two issues for safety significance. The reported scores ranged from 2 to 10 (most scores between 4 to 6) for one issue and ranged 5 to 10 (most scores 6 to 8) for the other issue. This reflects the reality that perceptions of safety significance are subject to individual differences. In the current exercise, similar variations in scoring were expected and led to differences between the trainee’s scores and the preferred decision set. The variation may be due to the inherent subjective nature of assessing these attributes and other factors such as experience, expertise, biases, and interpretations of the issue. So this could be one source of difference in the trainee decision selections versus the preferred set, as the decision process attempts to match action to significance. Another source could be in the decision options themselves. The decision choice by a trainee could have focused on what the trainee felt was the “best” (i.e., most efficacious) decision versus an explicit consideration of safety priority commensurate with safety significance. Additionally decision choices may have been influenced by their potential impacts, particularly under conditions where performance was not on track to meet goals. Taking this analysis a bit further, we looked at how decision balance varied over the course of the simulation. As discussed in our April 9 post we use decision balance to create a quantitative measure of how well the goal of safety culture is being incorporated in a specific decision - the extent to which the decision accords the priority for safety commensurate with its safety significance. In the instant exercise, each decision option for each issue has been assigned a balance value as part of the preferred scoresheet. ** Chart 2 shows a timeline of decision balances - one for the preferred decision set and the other for the actual decisions made by the trainee. A smoothing function has been applied to the discrete values of balance to provide a continuous track. The plots illustrate how decision balance may vary over time, with specific decisions reflecting greater or lesser emphasis on safety. During the first half of the sim the decision balances are in fairly close agreement, reflecting in part that in 5 of 8 cases the actual decisions matched the preferred decisions. However in the second half of the sim significant differences emerge, primarily in the direction of weaker balances associated with the trainee decisions. Again, understanding why these differences emerge could provide insight into how safety culture is actually being practiced within the organization. Chart 3 adds in some additional context. The yellow line is a plot of “goal pressure” which is simply a sum of the differences in actual performance in the sim to goals for cost, generation and CAP program. Higher values of pressure are associated with performance lagging the goals. Inspection of the plot indicates that goal pressure was mostly modest in the first half of the sim before an initial spike up and further increases with time. The blue line, the decision balance of the trainee, does not show any response to the initial spike, but later in the sim the high goal pressure could be seen as a possible contributor to decisions trending to lower balances. A final note is that over the course of the entire sim, the average values of preferred and actual balance are fairly close for this player, perhaps suggesting reasonable overall alignment in safety priorities notwithstanding decision to decision variations. A variety of training benefits can flow from the decision simulation. Comparisons of actual to preferred decisions provide a baseline indication of how well expected safety balances are being achieved in realistic decisions. Consideration of contributing factors such as goal pressure may illustrate challenges for decision makers. Comparisons of results among and across groups of trainees could provide further insights. In all cases the results would provide material for discussion, team building and alignment on safety culture. In our post dated November 4, 2011 we quoted the work of Kahneman, that organizations are “factories for producing decisions”. In nuclear safety, the decision factory is the mechanism to actualize safety culture into specific priorities and actions. A critical element of achieving strong safety culture is to be able to identify differences between espoused values for safety (i.e., the traits typically associated with safety culture) and de facto values as revealed in actual decisions. We believe this can be achieved by capturing decision data explicitly, including the judgments on significance and uncertainty, and the operational context of the decisions. The next step is synthesizing the decision and situational parameters to develop a useful systems-based measure of safety culture. A quantity that could be tracked in a simulation environment to illustrate safety culture response and provide feedback and/or during nuclear operations to provide a real time pulse of the organization’s culture. * For more information on using system dynamics to model safety culture, please visit our companion website, nuclearsafetysim.com. ** It is possible for some decision options to have the same value of balance even though they incorporate different responses to the issue and different operational impacts.